“Our engineer is working on the grant application right now. We are planning on a new water tower, repairs to water lines, and improvements at pump stations to increase water pressure.” If things go as planned, the water project could begin in 2009 and present utility rates might suffice. The City Crew has been reading water meters in recent months so the Council can get an idea as to how much water people generally use. This will help in evaluating base rates. Five months of readings are expected to be completed soon. Readings in the summer may be done to check on usage at the time of the year. Garbage collection in the city may change before too long, also. “We are working with Disposal Service of Montana. They will continue to pick up garbage, but the City will collect fees. Hopefully with everybody having to pay for garbage pickup, people will use it and not park dumpsters and highway borrow pits.” This change may be a few months off, yet. Hensel keeps track of the City’s 6 fulltime and one parttime employee and their payroll. Four are on the City Crew. (An extra serves as parkman in the summer.) The City employs and pays Kathleen Schreiber, the Public Librarian. 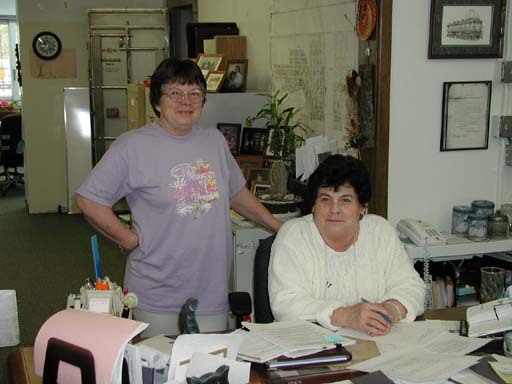 Then, there is Geri, the City Clerk, and Debbie Davis, who helps several hours a week in the Library and at City Hall. “Last year, the city’s property tax assessments were at $96,000, but we only received $73,000.” At the same time, law enforcement costs were $63,500. That cost will come down in 2009. So, 2008 is the year of the Budget Pinch for Harlowton. Mrs. Hensel says that the Council does have the option to request mill levies for such budget items as the park, pool and library. Amy Collins is also writing for a Bair Grant to help support the municipal swimming pool. For a number of years, Geri’s office was in the loft above the old library in the present City Hall and later in the Courthouse. When the Public Library moved next door to its present location, the City Office returned to its old place but using the whole space. Mrs. Hensel has worked with three mayors, Oscar Biegel, Rick Billadeau, and John Peccia, and 27 councilpersons. In all that time, there has only been one woman on the Council: CA Buckley from 1988 to 1991. Each new Councilperson also makes for change. Different councils can work together quite differently. Geri Hensel grew up in Virginia City, MT, and remembers it fondly. She is sad to see some of the changes which have come to it over the years. The Hensels came to Harlowton in 1968 when husband Tony was a highway patrolman. He is now foreman for the County Road Department. Geri and Tony’s five children are spread around the state and just beyond. Dan works for Montana Crane in Bozeman. Michael is a comptroller for bathroom fixture business in Nampa, ID. Charlie works as a plumber in Hardin. Marty is a Physician Assistant student at the University of Seattle. Jennifer lives in Ennis and works at Moonlight Basin. Geri’s sister Skip moved to Harlowton four years ago and is a cook at Wade’s Drive-In. Geri and Skip are known for walking the town rain or shine. Except when travel, holidays and company get in the way as in recent days. When they are at it, they cover two to four miles at a jaunt. Changes of season and holidays see the City Hall changing colors and feeling. Christmas, Winter, Valentines, St. Patrick’s, Spring, 4th of July, Summer, Fall, Halloween, Thanksgiving and back to Christmas. Geri only gets busy with major decorating at home over the Christmas holidays. Sounds like positive changes for the City.